The uniform of one of the Second World War’s most notorious Nazis, Hermann Goering, is up for sale at a British auction. It is expected to sell for £85,000. John Cabello, the owner of Parade Antiques in Plymouth, Devon, where it is being sold, bought the uniform at auction from a private Swiss museum. The uniform is being sold as a set, including the original tunic, trousers and braces worn by Goering. Other items include a replica peaked cap and an original Nazi general's belt. The grey blue uniform, which was made by Tiller, a Viennese tailor which made uniforms for the Nazis during the war, is sweat-stained. Cabello told the Daily Mail: “Goering was hugely overweight and had a tendency to perspire a lot. That would explain the profusion of sweat in the tunic. “This also proves it was worn for a long, long time by someone who was fat enough to cause it to stretch and wear over a period of time. “He also had a habit when he used to walk around talking to people of putting his left hand into his left pocket. Because of this the wear on the left pocket is substantially more than the right." Cabello said that the quality of the uniform is considerably lower than that of uniforms Nazis wore at the beginning of the war. “As the war progressed, it got harder to get materials and quality everywhere went down,” he said. 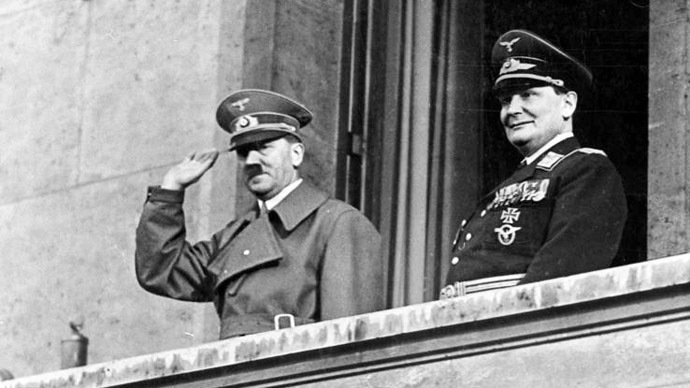 Goering was the founder of the Gestapo, the feared state secret police, and a close confidante to Adolf Hitler. After WWII, Goering was the chief defendant at the Nuremberg trials, and was sentenced to death for war crimes and crimes against humanity. He committed suicide in October 1946 on the night before he was due to be hanged. Jewish leaders have expressed their concern over the morality and ethics of selling a uniform that belonged to a brutal and cruel top Nazi leader. They said the uniform should instead be burned. Shop owner John Cabello justified his selling the uniform by saying the item was a reminder of Nazi atrocities and did not glorify them.